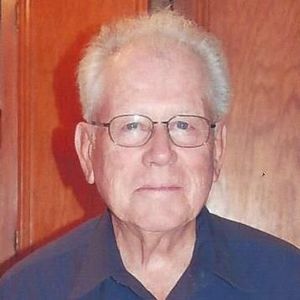 DRAKESBORO- Oscar Ray Brister from Drakesboro, Kentucky passed away July 9, 2016, he was 86 years old. Born on July 26, 1929 in Watseka, Illinois. Survived by his loving wife Ina Mirl (Drake) Brister of 69 years. Now living on the same road where they grew up as children. They literally spent all of their lives together. Survived by his four children, Larry Brister and wife Pat from Saint John, IN, Linda Lukas and husband Greg from Gary, IN, Teresa Holme and husband Randy from Carmel, IN and Tim Brister and wife Jana from Hanson, KY, his 7 grandchildren and 16 great-grandchildren. Also survived by his brothers, Don Brister, Phillip Brister and Russell Brister and his life long friend and first cousin, Marvin (Bud) Ellison. Predeceased by his father, Roy Oliver Brister, his mother Eula Delaney (Mefford) Brister and sister Carolyn Brister. Oscar retired in 1980 from Inland Steel Company in East Chicago, IN with 31 years of service. He worked in # 2 Open Hearth as a boilermaker and in # 2 BOF as a Mill Mechanic. After retirement he moved to the very place he and his wife grew up. There he worked as a carpenter and builder in Muhlenberg County, Ky. He was a faithful Christian man evidenced by his conduct in all areas of his life. He served as a Deacon at Black Oak Baptist Church in Gary, Indiana and after retirement served in the same capacity for 36 years at Forest Oak Baptist Church in Belton, Kentucky. Oscar developed a love of beekeeping in the last 6 years of his life. Visitation will be at the Tucker Funeral Home in Central City, Ky on Tuesday, July 12th at 5:00 p.m. Funeral will be Wednesday, July 13th at Forest Oak Baptist Church in Belton, Kentucky with visitation from 9:00 a.m. to 11:00 a.m. and funeral at 11:00 a.m. Pastor Vernon Cook will deliver the funeral service. Online condolence can be made at www.tuckerfuneralhomes.com. The beautiful and interactive Eternal Tribute tells Oscar 's life story the way it deserves to be told in words, pictures and video. Larry and Family, my thoughts and prayers go out to at this difficult time. Prayers for the family. And deepest condolences from a long time family friend. Here for you all. Oscar was a great man and always made me feel like family when I visited with Tim and Matthew. Prayers from my family to yours! You're in my thoughts! It was an absolute pleasure to meet Oscar when he visited England with Ina, Teresa and Randy. What a lovely man! We spent a couple of days sharing stories and it honestly felt like we had known him forever. Both Gracie and I want the family to know our hearts go out to you in losing a fine Christian man like Oscar. They will miss him dearly but God's Holy Spirit will give them the peace that passes all understanding. As for Oscar he's been greeted with " Well done good and faithful servant" by God the Father and the Lord Jesus Christ our Savior. We will be praying for you all in this difficult time. Please know that I am praying for you and you're family Tim. My thoughts and prayers are with you Ina,Tim.Jamie.Matthew and all of the family. Oscar was an amazing man and an amazing grandfather to my children. Again my thoughts and prayers go out to everyone who was blessed to have Oscar as a part of their life. My thoughts and prayers are with Ina,Tim.Jamie.Matthew and and all of these family. Oscar was an amazing man and an amazing grandfather to my children. Again my thoughts and prayers go out to everyone who was blessed to have Oscar as a part of their life.